NEW RENOVATIONS COMPLETED & READY FOR YOU TO ENJOY IN THIS WATERFRONT HOME WITH BAY & GULF ACCESS! The seller just completely renovated the pool area and it looks AMAZING! You will LOVE the beautiful STONE PAVERS around the screened in RESURFACED POOL overlooking the water. This is living the dream just stroll down to your dock to do some fishing or hop in your boat for a sunset cruise!! This lovely home has been well maintained over the years & the seller has also just completed UPGRADING BOTH GUEST BATHS. The master bath is BEAUTIFULLY RENOVATED as well with NEW TILE GLASS ENCLOSED SHOWER & QUARTZ COUNTERS. Great floor plan with lots of room to roam! The kitchen overlooks the family room & has GRANITE COUNTERS & SS appliances at a total renovation cost of $27000. Oh and did I mention the WATER VIEWS from nearly every room? Huge dining room & living room round out the space along with the 4 bedrooms. 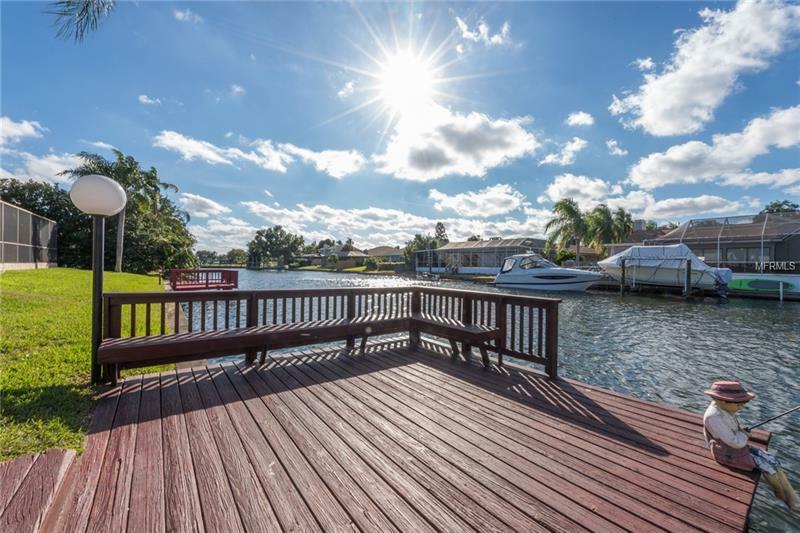 Also a 3 car garage with upgraded floor is definitely not the norm in Bay Port and a great bonus!Fun boating community with a lot of social events like lighted boat parade picnics by lake raft up parties! Or just do your own thing kayaking boating fishing enjoying docktails or swimming in your own pool with your family & friends! EXCELLENT LOCATION 15 minutes to the airport & 30 minutes to the beaches! Easy access to both sides of the bay! GREAT SCHOOLS only 5 mins to the much desired Berkeley Prep School! Come &see what a great place this would be to throw your anchor!